What an awesome catch this week with a 41 pound Cubera Snapper. We hardly ever see these fishing in Fort Lauderdale. Of all the snappers in the snapper family, these are the biggest. They have huge fangs, both top and bottom jaw, plus a lot of accessory teeth. And what a fighter! 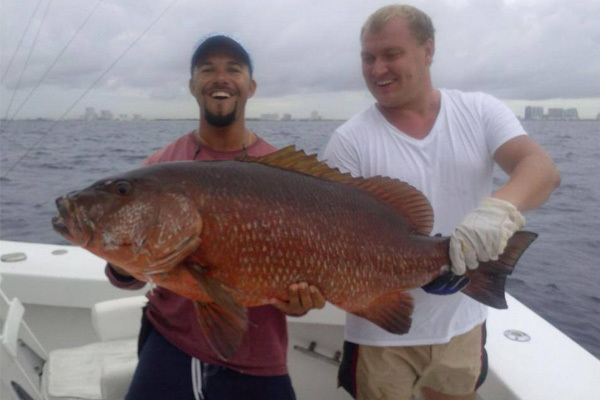 Cubera snapper have the size and strength to put up a long and tiresome fight. The way we normally target Cubera snapper is to use a live lobster for bait and even then they are a rare catch. Once in a blue moon, we’ll catch one while deep dropping around a wreck on a live bait. 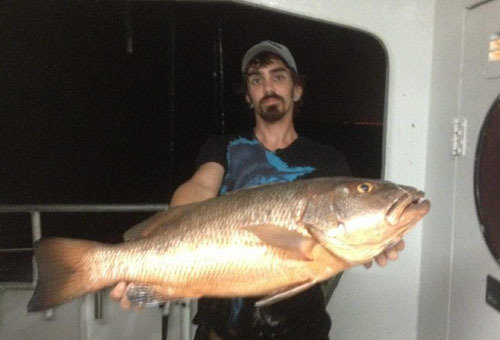 Amazingly, this is our second cubera snapper this month. This particular Cubera snapper we caught while we were shark fishing in 300ft of water. The fish ate a whole bonito that we had butterflied and sent to the bottom. The bait alone weighed about 6 pounds. When the fish got close to the surface and we could see it wasn’t a shark, I thought it was a grouper… there have been a few big warsaw groupers biting. The Cubera weighed 41 pounds. We put the baits back out and we caught our big shark, a 7ft sand bar shark which we caught and released. Great catch, I’d love to see more of these get caught and September is one of our best months for Fort Lauderdale snapper fishing. The night bite is hot in Ft Lauderdale the past few nights. Great catches of snapper, grouper, different kinds of sharks and more. 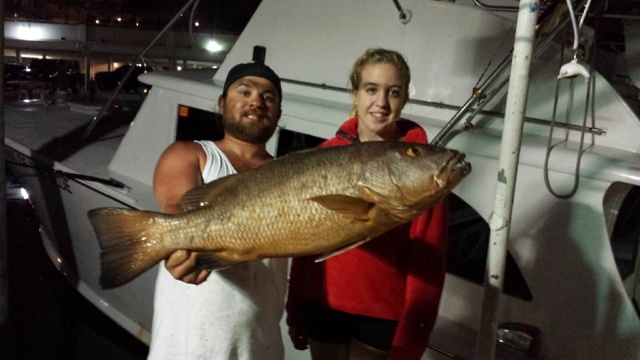 The big story this week was a nice cubera snapper caught by Rachel, from Texas. 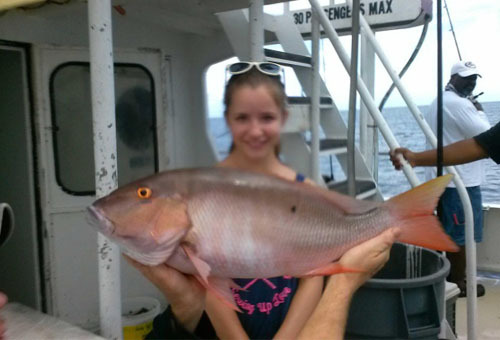 Cubera snapper are the largest snapper in the snapper family and are very rare for us to catch fishing in Ft Lauderdale. 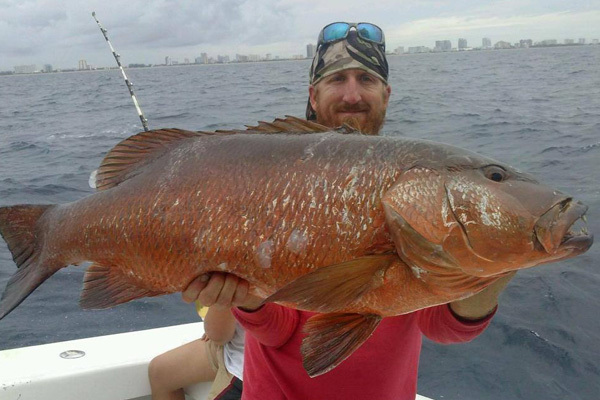 In fact, to have a chance at catching a cubera snapper, you usually need to use a live lobster for bait. This cubera snapper ate our normal bottom rig baited with a chunk of squid. What a bite! Larger mangrove and mutton snappers are biting also. We’re catching them in 60-70ft of water, anchor fishing and chumming. The mutton bite is getting particularly strong out there and is spilling over to the daytime trips too. Our morning and afternoon drift fishing trips are coming home with some big muttons too. Groupers are around and biting better this year than last. 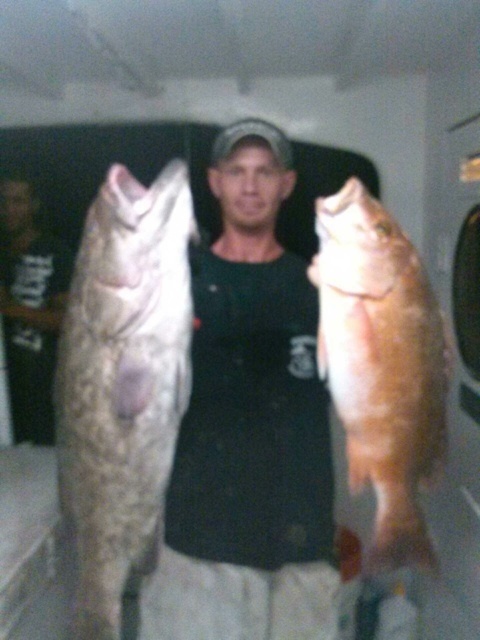 Black, gag and red groupers are being caught, mostly on our night fishing trips. And cobia are making their presence known as we’re catching a couple on the reefs and wrecks. You can catch anything at night and we do. Small to medium sized sharks are biting on our night trips, mostly blacktip and Atlantic Sharpnose sharks. They are fun to catch and put up a good fight on our lighter tackle. Grunts, triggerfish, squirrelfish, porgies, jacks and just about anything else that lives on the bottom can be caught night anchor fishing and mixed in with the catch. Our night trips are definitely catching the most fish out of any of our daily open party fishing trips. It’s a great time to come fishing and with it being so hot during the day, night fishing is a great way to get out there and do some deep sea fishing. Good luck everyone fishing this week, I’ll sea ya on the water.